What a zany quartet! They played their hearts out, and the Vancouver audience loved it!! These classically trained musicians came together to delight an audience because they were delightful themselves, with their humour and passion for tango music. This was tango in their own unique style, fusing classical, modern jazz, and rock music into tango. 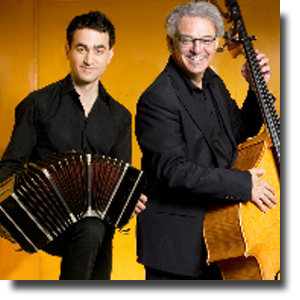 The repertoire included classic tango to tango nuevo and Piazzolla. Gosselin came up first with his description of the programme: don't follow the written programme because we play the pieces in scrambled order. And a lot of the pieces not included in the programme were playes, especially the original compositions by the quartet. But to the delight of the audience, these compositions were played with gusto. I could see the passion in Gsselin's movements, in Simard's percussion, and particularly, that bandoneon of Goldman who handled this classical tango instrument with pizzazz. Tango which originated from the barrios of Argentina has become an international ballroom affair, and we were itching to stand up and dance to the music of this quartet. But what uniqueness! Fusing Frank Zappa's music and Brubeck's jazz into tango...even Beethoven's fifth--unbelievable! This concert was indeed a treat and I hope this quartet returns again to delight BC audiences.